I had a request the other day from my cousin in San Francisco asking me to teach her how to make pilaf. She, and you, will be happy to learn there's really nothing to it. So, Valerie, this one’s for you. 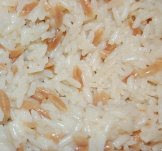 Selecting the rice: I prefer to use Uncle Ben’s parboiled rice for pilaf, however, Basmati or Texmati work well also. Just be sure to read the manufacturer’s directions for the proper proportion of rice to liquid, and the recommended cooking time. 1. Melt butter in a 2-quart saucepan. Add noodles and cook, stirring constantly, until noodles are golden. Do not let the butter or noodles burn. 2. Stir in the rice, and cook another minute or two. 3. Add the chicken broth and salt, if using, and stir. Bring to a boil, then cover the saucepan with a tight-fitting lid and lower the heat to simmer. 4. Cook for 15 to 20 minutes, or until all of the liquid is absorbed. 5. Remove the pot from the heat, place a paper towel between the top of the saucepan and the lid to help absorb any excess moisture. Allow the pilaf to rest for a few minutes before serving. 6. Place pilaf in a bowl or on a platter; serve immediately. That's it! Now it's your turn to try. Hi thank you for the recipe, you're cooking is great. Can I substitute orzo instead of the noodles? Sure, orzo works really well in pilaf. Try it and see! I should add that you might need a little extra liquid in the pilaf recipe, if using orzo, because the orzo takes longer to cook than the thin noodles. Do not steal other's native food. love your recipe, check out another one for it at www.armeniankitchen101.com!!! You're right, Kim. My mother-in-law used a lot of butter in her pilaf, too; that's what made it so delicious. In an effort to make this dish a little healthier, we cut down the amount of butter quite a bit. Use as much - or as little - butter as you prefer. In fact, you can use olive oil, Smart Balance, or skip the fat altogether, and just toast the noodles in the oven or skillet until they're golden brown. But, who wants pilaf without that yummy, buttery taste? My grandmother took her recipe to the grave with her but her rice pilaf and mushrooms in it do you have a recipe for that rice pilaf. 1. In a saucepan over medium heat, combine butter and olive oil. When butter has melted add fine noodles, onion and garlic. Cook until noodles begin to turn brown and onion and garlic soften, about 2 to 3 minutes. 2. Add mushrooms. Cook 3 minutes or until mushrooms soften slightly. 3. Stir in rice, cook until rice starts to turn slightly brown. Stir occasionally to make sure rice doesn’t stick to the bottom of the pan, about 4 minutes. 4. Stir in broth; bring to a boil. Reduce heat to medium-low. Cover and cook 20-25 minutes. Remove pot from heat. Allow rice to rest about 5 minutes before removing lid. 5. Fluff rice with a fork; add black pepper. Serve. I use a stick of butter as well. That's what makes pilaf what it is AWESOME. Any good Armenian knows that. lots of butter and lots of chicken broth you can use water and the powder chicken flavoring. but the powder can make the pilaf very salty if you add to much plus it alters the taste of the pilaf. someone made it that way once for a holiday gathering they switched back to the broth after that. Has anyone had a rice dish which included nuts, chicken pieces, small pieces of liver, cooked in broth and then baked, wrapped, in a couple of sheets of phyllo dough--the one I ate was baked in a bundt dish and was turned out onto a plate to be sliced and served.